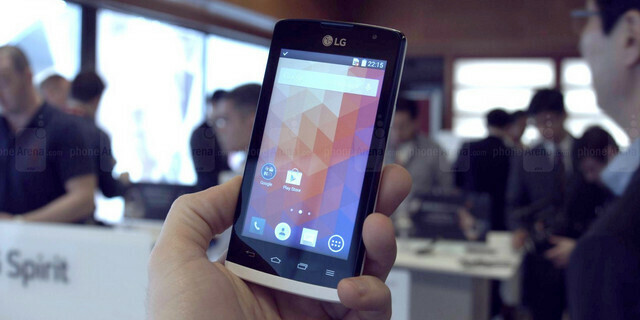 The LG Joy is one of the most affordable Android phones on display at the Mobile World Congress 2015: a compact, 4-inch device with a quad-core chip and a 5-megapixel camera, it checks all the bases. In terms of the design, the LG Joy is not at all pretentious: it features a plastic body with an accent on the bottom and some pretty sizable bezels. Still, it fits easily in the hand and is very comfortable for single-handed use. Interestingly, we're seeing a four-button setup for navigation that we haven't seen in years (hello, Android Gingerbread times!). The 4-inch screen features a 480 x 800-pixel resolution with a pixel density of 233ppi, but the sharpness is not the big problem here as it is the cheap LCD screen with washed out colors that seems like the bigger issue. What's under the hood? An entry-level quad-core chip of unknown variety and 1GB of RAM, and overall the phone seems to run fairly nicely, without any major hiccups. The 5-megapixel camera gets the job done without too much visual flare in pictures, and we appreciate having a front-facing camera for the occasional selfie and video chat on such an affordable phone. Take a look at our hands-on impressions of the LG Joy right below.